There was a heavy rush of followers since morning on roads leading to the Chaityabhoomi, the place of the Dalit icon's cremation, in central Mumbai. 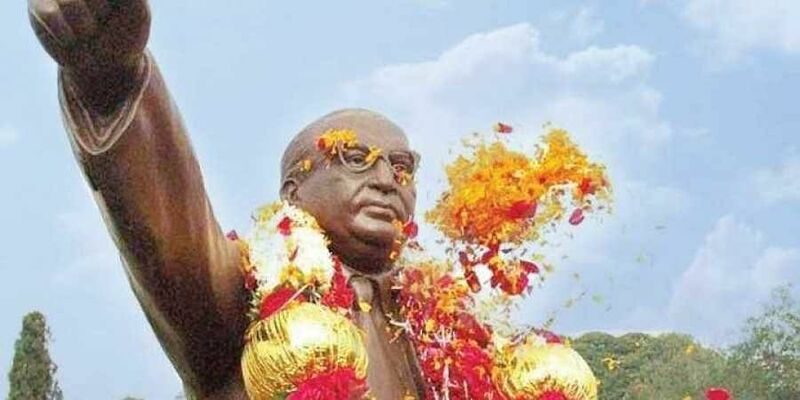 MUMBAI: Thousands of people paid tributes to Dr B R Ambedkar on his 62nd death anniversary here Thursday. There was a heavy rush of followers since morning on roads leading to the Chaityabhoomi, the place of the Dalit icon's cremation, in central Mumbai. People had been gathering in the city since the last three days to pay their respects to Ambedkar on the 'Mahaparinirvan Diwas'. Volunteers of the Samata Sainik Dal, an organisation founded by Ambedkar, were supervising crowd management in central Mumbai. The city police maintained a strict vigil and traffic restrictions were also imposed on some roads for the convenience of people. The Brihanmumbai Municipal Corporation (BMC) also made elaborate arrangements to deal with heavy rush of people. A senior BMC official said large pandals were set up at the Shivaji Park and civic personnel were instructed to arrange basic amenities like water tankers, mobile toilets, ambulances, temporary shelters for visitors. A giant screen was set up for the live telecast of prayers being offered by Ambedkar's followers. "A control command centre was monitoring the movement of visitors," he said, adding that doctors, fire brigade and disaster management were also deputed. The BMC would also distribute over one lakh booklets to visitors, giving details of the Mahaparinirvan Diwas. The Mumbai Police also stepped up security around the Chaityabhoomi. "We have a strong police presence in central Mumbai to maintain law and order," he said, adding that security men in civil dress were also keeping an eye on the crowd. Traffic restrictions have also been imposed till Friday midnight and some roads leading to the Chaityabhoomi have been closed, he said. All heavy and goods vehicles, except the civic-run BEST buses, will be diverted from Mahim junction via Mori Road towards Senapati Bapat Marg to ensure smooth flow of traffic, police said.